A 26-year-old homeless man who went viral after a photo surfaced of him handing out his resume on the side of a highway has received hundreds of job offers as a result of his bold job-seeking effort, PEOPLE reported. 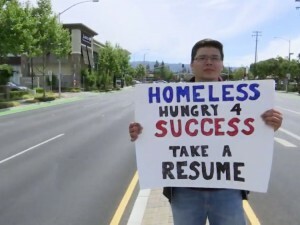 David Casarez held up a sign at a median that read: “HOMELESS. HUNGRY 4 SUCCESS. TAKE A RESUME” on Friday, attempting to catch the eye of potential employers. Despite graduating with a degree in management information systems from Texas A&M University, Casarez lost all his money when attempting to launch a startup in California. He was subsequently rendered homeless, losing absolutely everything, including the vehicle that had temporarily served as his home. Casarez said he had taken up residence in a local park, with nowhere else to turn. As you can see below, her picture went viral, garnering over 135,000 replies and 133,000 retweets. According to a follow-up tweet from Scofield, Casarez has since received approximately 200 job offers, including from web giants Google, Netflix and LinkedIn. Casarez said that holding up a sign on the side of a freeway was very much a last resort job-seeking tactic for him. Casarez himself took to Twitter on Sunday to thank everyone for the vast outpouring of support: “Thank you everyone for the outpouring of support! I am completely floored by how many are interested in my #Hungry4Success story. I have met several who have been or currently are in the same situation tell me their story. I am glad to be an inspiration for you all.